Some Odds-On Favorite Ways to Visit the Homes of Lexington&apos;s Four-Legged Stars. Beautiful horse farms have been part of the Bluegrass since the region was first settled, and so have horse farm visitors. Early 19th-century travelers remarked on the beautiful country estates of the Bluegrass noting, as one put it, "a handsome horse is the highest pride of a Kentuckian." 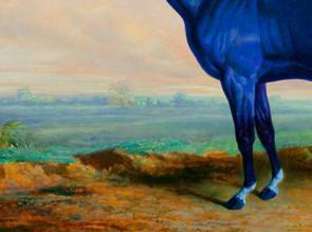 When great 20th-century Thoroughbred Man o&apos; War retired to stud in the Bluegrass, visitors from around the world flocked to see him. Man o&apos; War&apos;s groom, Will Harbut, kept ledgers for visitors to sign. When Man o&apos; War died in 1947, there were 63 ledgers containing over 1.3 million names. Ready to do your part to uphold this great Bluegrass tradition? Visiting a horse farm while you&apos;re in town is a uniquely Bluegrass kind of experience you&apos;ll long remember. And it&apos;s easier than you might think. There are about 450 horse farms in the region (about 150 in Lexington/Fayette County alone). They&apos;re all working farms- which means you should never just "drop by" -but more than a few allow visitors by appointment or through arrangements with professional tour companies. Bluegrass Note: Horse Country, Inc. provides a great way for visitors to connect with many of our celebrity horses and get "behind the gates" at the region&apos;s legendary Thoroughbred Farms. See www.visithorsecountry.com to learn more. Here&apos;s how you can revisit racing history, see the world&apos;s most fabulous farms and barns, get up-close-and-personal with Kentucky Derby winners, or discover an exciting variety of horse breeds. Hoof-it-yourself by making appointments at specific farms. If your interest is general and your time limited- or if you&apos;re shy about calling a horse farm on your own- consider taking a regular guided group tour. 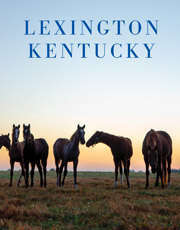 The itinerary is planned by the tour company to offer an overview of Lexington and its horse farms. Some farms allow visitors only through tour companies. On the other hand, three hours on and off a bus is probably not the best option for those with restless youngsters. And since horse farms may be just a small part of the itinerary, ask in advance what the tour will include to see if it has enough horse stops to satisfy your interest. Although offered daily most of the year, reservations are still needed for the tours. Make them as far in advance as possible because tours can sell out, especially during peak visitor times. Blue Grass Tours. (859-252-5744). Two tours daily at 9:00 a.m. and 1:30 p.m. Monday through Saturday, and 1:30 on Sunday, spring through fall, with a minimum of four guests. Tours last about three hours and include a stop at a local horse farm, Keeneland Race Course, and other points of interest. Pick-ups available at several hotels. $35; $25 for ages 12 and under. Call for information about longer tours like "Horses, Hooch and History" which includes a box lunch and at stop at a distillery. Horse Farm Tours, Inc. (859-268-2906 or 800-976-1034). Tours are given daily at 8:15 a.m. and 12:45 p.m. seven days a week year-round. Every tour includes a drive by Calumet, two or three farms to see mares, foals and stallions, plus Keeneland and lasts about three and a half hours. Tours depart from several area hotels. $38 ($45 during Derby week). Children under 12 are $28. Thoroughbred Heritage Horse Farm Tours. (859-260-8687). Tours offered daily at 8:30 a.m. and 12:30 p.m. year-round departing primarily from the Embassy Suites. This three plus hour tour includes a drive by Calumet, a tour of Keeneland Race Track, an up-close personal encounter with Thoroughbreds and points of interest from the movies Seabiscuit, Dreamer and Secretariat. $36 ($40 in winter). Children 12 and under are $26. Unique Horse Farm Tours. (859-213-6653). Departing from several hotels near the Kentucky Horse Park, usually at 8:30 a.m. and at noon, this tour gives you the behind-the-scenes stories about the people and horses that make Lexington "Horse Capital of the World." Tour historic estates and new multi-million dollar farms on this two and a half to three hour van tour. Adults are $40. Children 12 years old and under are $20. Bluegrass Note: Horse breeding has been an important Bluegrass industry since the area was first settled. Daniel Boone himself introduced a bill for "improving the breed of horses" at Kentucky&apos;s first legislative assembly. Thou shalt make arrangements in advance. While it can be said with absolute surety that no farm in the Bluegrass welcomes unexpect ed guests, other visitor policies will vary from farm to farm. Some farms allow visitors only on certain days or limit tours at certain times of year such as breeding season (February through mid-July), Kentucky Derby time, during the horse sales, or during race meets. Some horses may not be on view to visitors, so if you&apos;re hoping to see a particular horse, inquire about its status in advance. Don&apos;t feel intimidated if your knowledge or interest isn&apos;t that specialized. Most visitors aren&apos;t quite that savvy; they just want to see the world&apos;s most beautiful horses and horse farms. Need we say that you&apos;ve come to the right place? Bluegrass Note: Here are some horse farm visit basics, no matter how or when you visit. *Wear comfortable clothes and sturdy shoes. *No feeding or petting the horses. Horse personalities, like human temperaments, vary widely. They may bite or kick. *The farms just look like parks....no picnics. *You won&apos;t be able to sit on or ride the horses. *It&apos;s customary to tip the farm representative who shows you around, usually $5 to $10. If taking a private or van tour, ask if the fee includes tips. Most Kentucky Derby winners are "retired" to Bluegrass farms to begin their second career in the breeding shed. If you want to see just one or several of these living legends, the following farms are excellent choices, and all use www.visithorsecountry.com as their online booking portal. Coolmore America&apos;s Ashford Stud, near Versailles, is home to 2015 Derby (and Triple Crown!) winner American Pharoah, 2000 Derby winner Fusaichi Pegasus, as well as 1995 Derby winner Thunder Gulch and will show their majestic stallions by advance appointment. Giant&apos;s Causeway, whose stud fee is $75,000, also resides here. Like a growing number of stallions, many of Ashford Stud&apos;s travel to the Southern hemisphere after the Kentucky breeding season ends, so they may not be at home July through January. Tours are offered Monday through Friday at 3 p.m. During Derby Week one additional tour at 10 a.m. will be offered. WinStar Farm encompasses about 2,700 acres of majestic Bluegrass landscape, with divisions for stallions, broodmares, foals and yearlings as well as a racing stable. A top force in the Thoroughbred industry WinStar bred the 2010 Kentucky Derby Winner Super Saver, and many other champions. Public tours meet at the state-of-the-art stallion barn and include the breeding shed. Tours are usually given Mondays, Wednesdays and Fridays (except holidays and Oaks Day). Jonabell Farm, home of the Darley stallions in America, is where you will find 2016 Derby winner Nyquist, 2011 Derby Winner Animal Kingdom and 2007 Derby Winner Street Sense. Learn about the global scope of His Highness Sheikh Mohammed bin Rashid Al Maktoum’s international breeding and racing operations. The ninety minute tour begins inside the farm office. You’ll head outside for a stallion viewing, visit the breeding shed, and hop on a shuttle for a drive through the rest of the farm and a chance to get up close to broodmares, foals, and weanlings. Taylor Made Farm. Taylor Made Farm was created in 1976 to provide care for mares shipped to central Kentucky to be bred to stallions standing here. The farm, which began as 120 acres, has expanded its scope and its acreage. Now over 1,600 acres, it is one of the leading sales agencies in the world. In 1999, three Taylor Made graduates won races at the Breeders&apos; Cup--a feat unparalleled in racing history. Northern Afleet is among the top stallions in residence and 2014 Derby Winner California Chrome makes this farm his home. While the following farms may not have a living Kentucky Derby winner, they have their own unique history as well as lavish barns and landscaping. Call Normandy farm direct; tours of the others can be purchased at www.visithorsecountry.com. Three Chimneys Farm, located on scenic Old Frankfort Pike, west of Lexington, has everything you&apos;d expect to see on one of the world&apos;s finest horse farms, and some of the super stars of the Thoroughbred world! Three Chimneys offers tours of their Stallion Division in April and October, Tuesday through Saturday. April tours begin promptly at 1 p.m., while October tours begin at 10 a.m.
Claiborne Farm, near Paris, has a strong and unbroken influence on the Thoroughbred industry. Owned by the Hancock family, Claiborne has been a leading Thoroughbred farm for generations. The guided tour includes the simple tombstone that marks the grave of the great Secretariat, 1973 Triple Crown winner (and considered by many to be the greatest race horse of all time). Currently, tours are given seven days a week at 10 a.m.
Bluegrass Note: An expansive listing of farms, along with histories of some leading farms, can be found in the book Horse Farms and Horse Tales of the Bluegrass by Wilma Beale, available at local bookstores and on amazon.com. Lane&apos;s End Farm. This beautiful farm has been compared to a national park. During the off season, tours are offered on Thursdays at 10 a.m. No tours are available during the breeding season, which runs from February to the end of June, or while the Keeneland and Fasig-Tipton sales are taking place. Elizabeth II, Queen of England, is fond of this farm; she’s been an overnight guest on more than one occasion! Normandy Farm on Paris Pike is famous for its unusual L-shaped barn commissioned in 1933 by then-owner Joseph Widener. The barn features a clock tower, and its roof, gables, cupolas and dormers are adorned with ceramic cats and other animals. The farm also includes an interesting cemetery, in which a life-size bronze statue of Thoroughbred champion Fair Play overlooks the graves of Fair Play and Mahubah, sire and dam of Man o&apos; War. Tours by appointment only; April through October, Monday through Friday. Call this farm directly at (859) 294-9595. Over thirty Thoroughbred farms and equine facilities, including famed Hagyard Equine Medical Institute and Rood and Riddle Equine Hospital, have banded together to offer a variety of opportunities for visitors to the Bluegrass Region. If you have your own transportation, you can go online and choose a tour from their ever expanding offerings. Tickets for adults start at $20 per person. Most tours last about one hour. Gratuity is always included when you book and purchase a tour at www.visithorsecountry.com. Sign up for their e-newsletters and you&apos;ll be the first to know about special opportunities to connect with our most famous celebrity horses. If you like to travel at your own pace, have specific farms, horses and attractions you want to see- or want the added allure of "insider" knowledge and access- you can hire a private guide for a custom tour. This is the luxurious way to go. Most private tour companies have access to a variety of farms not open to groups or do-it-yourself tours. You can make pit stops or photo stops as often as you like. And your guide should entertain you with all kinds of fascinating facts, legends and lore. As you might expect, private, custom tours cost more than guided group tours but may turn out to be a somewhat comparably priced alternative if you have more than a few people in your family or group. In most cases, custom tours are offered as a "step-on service" - the guide joins you in your vehicle. Some companies will provide transportation, especially for groups. What you&apos;ll pay for a custom tour can vary widely depending upon the tour company, the length and content of the tour, the number in your party, and whether you use their transportation or yours. Minimum prices recently quoted ranged from $100 to $175 for a two or three hour tour for a few people. Here are companies that offer private, custom tours. All are friendly and knowledgeable. A good way to choose one is to call in advance of your visit to discuss possible itineraries and rates and to get a sense of which guide&apos;s personality and tour style might best complement your own. While Old Friends focuses primarily on stallions, Our Mims Retirement Haven, just north of Lexington in Paris, Kentucky, takes care of retired Thoroughbred Broodmares. Calumet&apos;s champion 3 year old filly Our Mims resided on this farm in her later years, and her grandson 1997 Breeder&apos;s Cup Sprint winner Elmhurst, lives here now. Meet Elmhurst and other great ladies of the industry. Watch the whole herd interacting in the Haven&apos;s pastures. Visitors are encouraged, by appointment. Call (859) 227-6304. You may think that a horse farm is a horse farm is a horse farm, but it just isn&apos;t so. Most farms specialize in a specific breed of horse. Most Bluegrass farms are Thoroughbred operations, breeding and training horses primarily for racing. Kentucky produces more Thoroughbreds than any other state. But you can also see many other kinds of horses in the "Horse Capital of the World." American Saddlebreds, used for show and pleasure riding, are Kentucky&apos;s only native breed of horse. Saddlebred farms that allow visitors by appointment include Wingswept Farm, 1529 Keene-Troy Road near Nicholasville (859) 219-9857 and Blue Willow Farm, 4400 Delaney Ferry Road in Versailles (859) 873-2339. Take a fascinating look into the world of sport horses at Spy Coast Farm. 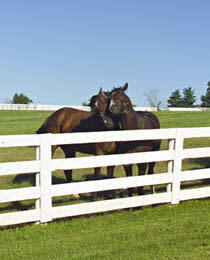 This breeding, nursery, training and boarding facility near the Kentucky Horse Park offers informative tours through www.horsecountry.com 3468 Sport Horse Lane, Lexington (859-280-3063). For a friendly visit with Morgan horses, America&apos;s first breed of horse, visit Bonnie and Fred Neuville&apos;s Burr Oak Farm in Scott County. The Morgan horse sprang from a single stallion raised in Vermont in the late 1700s. (502) 863-0887. Angel&apos;s Acres, also in Scott County, has Morgans, too (502) 863-0399. It&apos;s not just a State Park, it&apos;s a working horse farm, too -- and much more! The 1,200 acres that comprise the Kentucky Horse Park have served as an active horse farm since the 18th century. Featuring up to 50 breeds of horses at work and play, including 2003 Derby winner Funny Cide and 1994 Derby winner Go for Gin. The Park offers a variety of equine presentations to educate and entertain, along with horse drawn tours and carriage rides. The grounds are home to the National Horse Center. Many of the top equine management associations and breed organizations have their national or state offices located here. Filling six office buildings in the Park, the Center is home to The United States Equestrian Federation, The Pyramid Society, the American Hackney Horse Association, the American Hanoverian Society, U.S. Pony Clubs, Inc., and many more. The Park is open seven days a week from around March 15 to October 31, 9 a.m. to 5 p.m. During the winter the Park is closed on Mondays and Tuesdays. (800-678-8813 or 859-233-4303) Note: During Rolex weekend each April, the only four star FEI sanctioned three-day event in the Americas, you must purchase admission to Rolex to enter the Park. Bluegrass Note: Call VisitLEX and ask for the Lexington Walk and Bluegrass Country Driving Tour map. One side is a walking tour of historic downtown Lexington. The other side is a scenic loop around Lexington with suggested side trips. These self-guided tours are designed to be followed at your own pace and can be adapted to your own schedule. It&apos;s a large format, colorful paper map. For more information contact VisitLEX at (800) 845-3959. By Teresa Day, a freelance writer based in Lexington, KY. The latest "horse" movie to use the Horse Capital of the World as a backdrop? Disney&apos;s Secretariat. Who loved the movie Seabiscuit? Also filmed in part in horse country!